At the start of the Civil War in 1861, 15-year-old Charlie leaves his farm and enlists in the First Minnesota Volunteers. After experiencing the horrors of war, Charlie comes back a man changed forever. 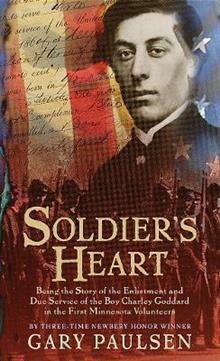 This stark, utterly persuasive novel of combat life ( New York Times ), by a ... read full description below. In June 1861, when the Civil War began, Charley Goddard enlisted in the First Minnesota Volunteers. He was 15. He didn't know what a shooting war meant or what he was fighting for. But he didn't want to miss out on a great adventure. The shooting war turned out to be the horror of combat and the wild luck of survival; how it feels to cross a field toward the enemy, waiting for fire. When he entered the service he was a boy. When he came back he was different; he was only 19, but he was a man with soldier's heart, later known as battle fatigue. Gary Paulsen is the author of more than 100 books.